A few weeks ago I shared Kleenex's fabulous Softness Worth Sharing initiative with you. This initiative is one I am proud to be part of and share with my girls because it is all about thinking of others and surprising them with a care pack and a small gesture of kindness. Who wouldn't be happy to be on the receiving end of that, right? As a mom, I try to impart to my girls that we should not only think of others but that we should be a good friend and show we care to those that may need it. It can be as simple as a smile at the grocery store, holding a door open or helping a friend pick up something up they dropped at school. In order to lead by example, I wanted to take the opportunity and show my girls how we can make a big impact on someone's day with a small gesture. A good friend of mine was recently unwell. Those fall colds are running rampant. Being a mom, means we don't really get a sick day when we don't feel well. So, I packed up a Kleenex Care Pack for Mom which included - lip balm, 1 oz. hand sanitizer, coupon booklet, Kleenex® Brand Share Pack, Kleenex® Brand Slim Pack, and a card redeemable to download four songs from up and coming Universal Music Artists including: Andy Grammer, Miloš Karadaglić, Avi Avital and Rebecca Pidgeon and added a few activities and treats for the kids and delivered it all to her doorstep with a little note to let her know we were thinking of them. Not only did the Kleenex Care Pack come in handy to combat those sneezes and sniffles but we also provided her with a few precious moments to relax while her children were happily engaged in the pre-Halloween activities we sent over including foam pumpkins, masks to decorate, activity books and pencils and beaded necklaces to string. 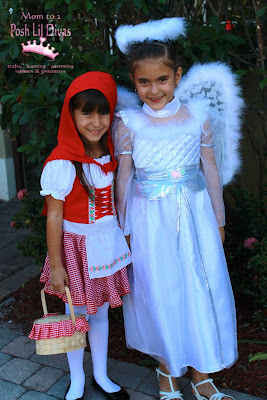 Halloween is just 2 days away and we have been battling colds here for over a week, one by one. 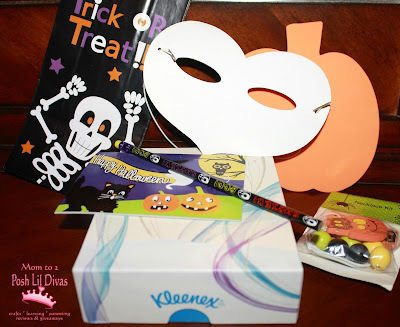 As we enjoy a cold snap and cooler weather this Halloween, I know what I will make sure is in my purse when we head out the door to go trick-or-treating - kleenex tissues. I wouldn't want my adorable Angel and Little Red Riding Hood to knock on someone's door with sniffles running down their nose. Would you like to surprise to someone and show them how much you care? Showing you care with Kleenex is as easy as 1,2,3! 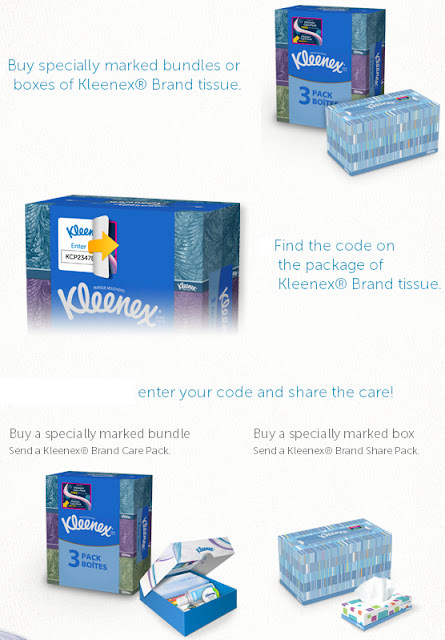 Just purchase a specially marked box of Kleenex Brand tissue, find the code and enter it online. 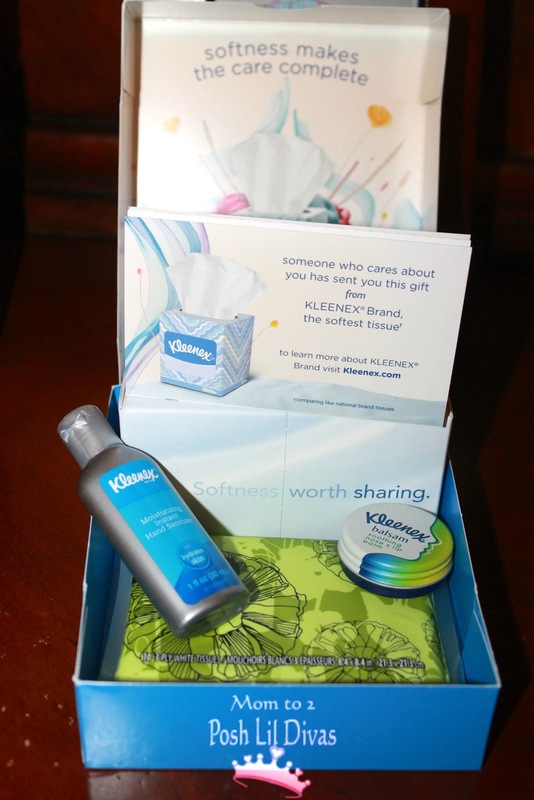 Then share the Kleenex Brand Care Pack!